Charity | Save stamps for charity - U.A.E. Save stamps for charity – U.A.E. Leonard, a terrier, was found in Essex, underweight and wary of people. He now lives with his new owners Claire and Pete in Maidenhead. The Royal Mail in the UK is commemorating Battersea Dogs & Cats Home 150th anniversary with a set of special stamps showing some of its success stories. I challenge you not to say “aaah” to these pictures (click here). They are gorgeous. It’s also a reminder to get your stamps (with or without pictures of dogs on them) to me as soon as possible as I will be sending a parcel off to the RNIB at the end of next week. Even one or two will help towards their fundraising target to benefit people who are blind and visually impaired. Leave a comment or visit the How to page for contact details. If you want to know more about Battersea Dogs & Cats Home click here. I keep receiving belated Christmas cards in my PO Box and take great pleasure snipping the stamps off as I know they will benefit the RNIB. 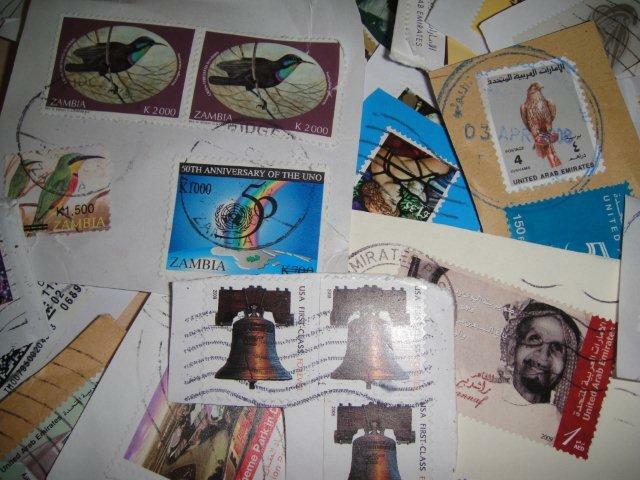 Thank you to everyone who has sent stamps – they have arrived in the UAE from all over the world so are more valuable in raising money for people who are visually impaired. Really appreciate your contributions – please send them or deliver them to me….and spread the word. I’d like to make up a really nice parcel to send.